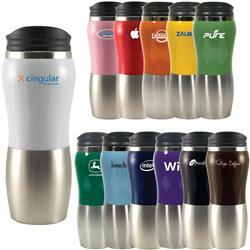 The Maui Fusion Custom Travel Mug with your promotional logo. Hands down the best styling, quality and look for a terrific price, this Maui Fusion 14 oz. tumbler is constructed with 18/8 Stainless Steel. Features 2-tone acrylic and stainless steel tumbler, foam insulated with a swivel lid to open and close. The patented push-on swivel lid is a great time saver. Beautiful design, nicely priced with a high perceived value. These are the kind of mugs that retail at $20 at coffee shops. The custom tumbler features a two tone look with colored top and stainless steel bottom and liner. Take this tumbler with you and commute in style! Comes with a free gift box. On special now at 144 pieces. Available Colors: Sky blue, blue, brown, red, black, apricot, dark green, green, pink, white, purple, and yellow. FREE RUSH PRODUCTION AVAILABLE – INQUIRE! Typical Imprint Area(s): Imprint area H x W x Wrap 1-1/4 x 2-3/4 x 8. Available Imprint Options: Second color imprint add $0.55 each. 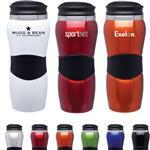 14 oz 2-tone acrylic and 18/8 stainless steel tumbler, foam insulated, swivel lid, Promotional Travel Mug. 24 per case at 21 lbs.